Jockey Hugh Bowman has been passed fit to continue his incredible association with the world’s best mare Winx when she chases a world record 17th Group 1 flat race success in the George Ryder Stakes 2018. Hugh Bowman continues his star association with gun mare Winx in Saturday’s George Ryder Stakes 2018 after being passed fit to ride. Photo: Daniel Costello. It has been a shaky autumn for the master hoop whose dual careless riding suspensions saw trainer Chris Waller rescheduled the first-up run of Winx. She kicked off over a mile in the Group 1 Chipping Norton Stakes (1600m) on March 3 for a seven length romp home after bypassing the Apollo Stakes a fortnight earlier. Bowman was then thrown from his mount Performer in the Group 2 Todman Stakes (1200m) at Randwick on March 10 when Waller’s Exceed And Excel colt was having his final lead-up to the Group 1 $3.5 million Golden Slipper (1200m). Miraculously Bowman escaped serious injury suffering only from a concussion during the horror fall. He passed his final cognitive test on Monday and was found medically fit by Racing NSW stewards for his Golden Slipper Day rides this Saturday at Rosehill Gardens. “I won’t ride Wednesday at the Gosford races but I will take rides Thursday [at Newcastle],” Bowman told The Daily Telegraph yesterday. “I’m still a bit sore in the shoulder from the fall and I wouldn’t say I’m feeling on top of the world but compared to last week, I am feeling a lot better. The star attraction will be when he jumps aboard Street Cry six-year-old Winx in the Group 1 $1 million George Ryder Stakes (1500m). 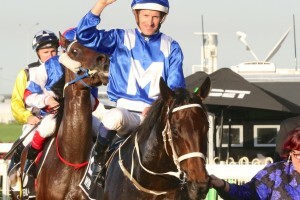 Success will see Winx surpass the current 16 Group 1 flat race wins record she co-holds with American champion John Henry and the mare’s part-owner Peter Tighe was relieved Bowman was available again. “It means the world to us to have Hugh fit and well,” he said. Waller has prepared five of the past eight George Ryder Stakes winners including the dual champion Winx who has saluted for the punters the past two years. Winx is unsurprisingly odds-on in George Ryder Stakes betting at Ladbrokes.com.au currently paying a pre-field price of $1.10 to make it 24 straight victories, 20 on the trot with Bowman aboard. Bowman’s other major mount at Rosehill on Saturday is back aboard Performer in the Golden Slipper Stakes field. Performer remains one of the best in Golden Slipper betting despite his Todman Stakes mishap and the youngster has won a subsequent Randwick trial in the wet on March 15. That winning hit-out on a Heavy (8) course could prove crucial for Performer with the possibility of a rain-affected Rosehill track on the weekend. Check out the latest Rosehill racing odds including Winx betting markets for the George Ryder Stakes 2018 now at Ladbrokes.com.au.